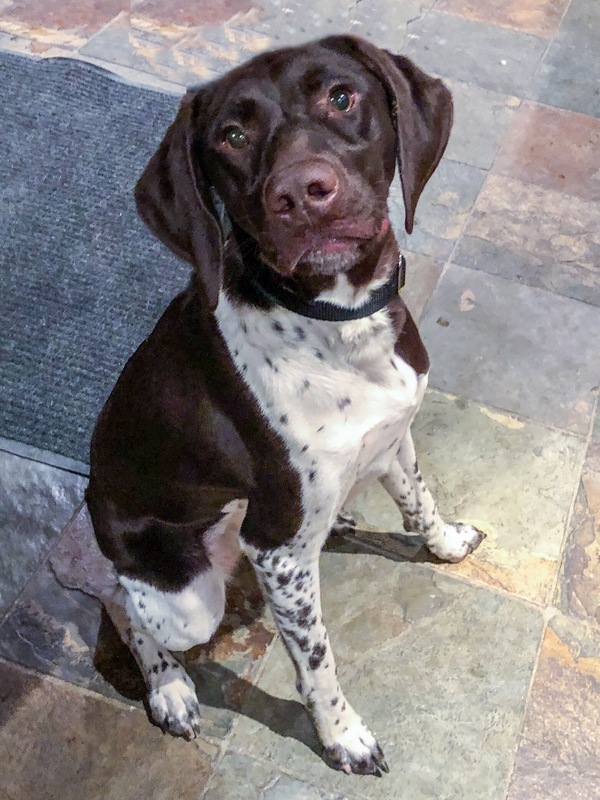 On Friday night, October 26, 2018, Brian and I were on our way out the door to go to dinner when we got a call about someone in our area who wanted to surrender their German Shorthaired Pointer, and wanted the dog out of the home as soon as possible. 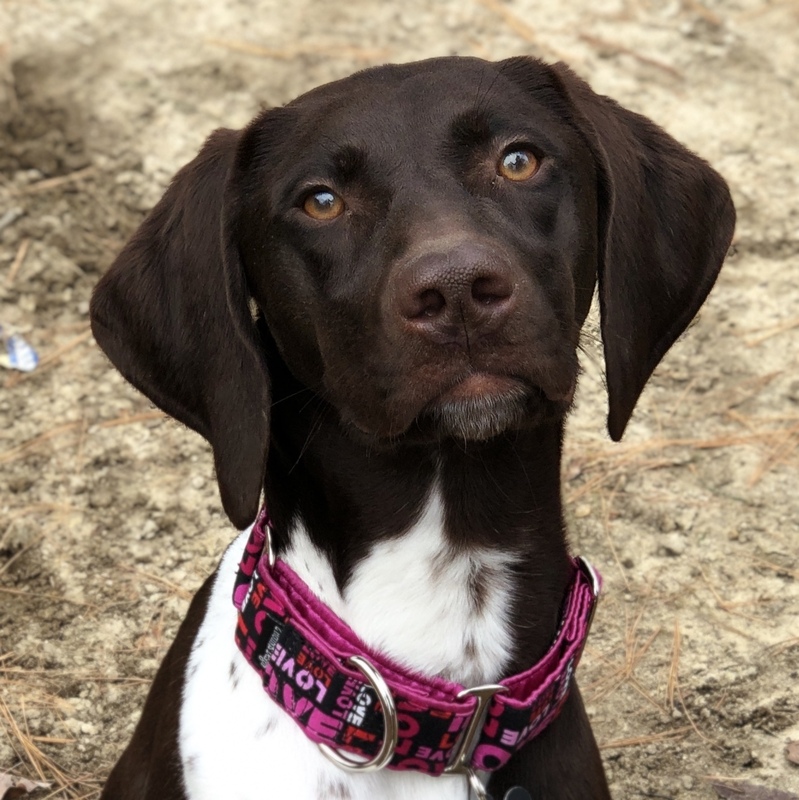 GSP Rescue of NJ had a foster family who quickly stepped up to foster, so all we needed to do was pick up the dog and have her as our guest for the weekend until the foster family could pick her up. We contacted the owner, and postponed our dinner plans. We met Maxeen in the owners home. 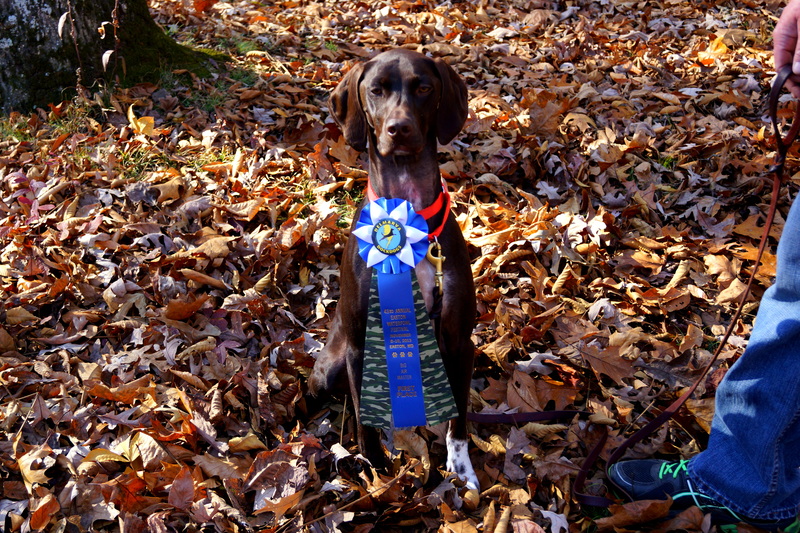 Her owner told us that Maxeen is 15 months old, and was purchased as a hunting dog. Maxeen did not have any interest in hunting, and spent a lot of time in her crate. 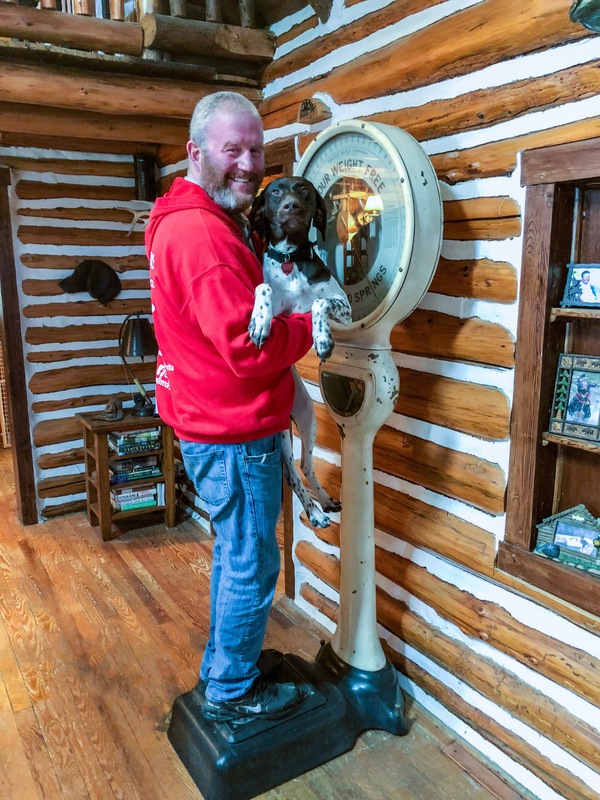 Since her owner was avid hunter, and knew he could not give Maxeen the time she needed, he thought it was best to re-home her. After proper paperwork was filled out, we brought Maxeen back home with us. Maxeen was amazing. 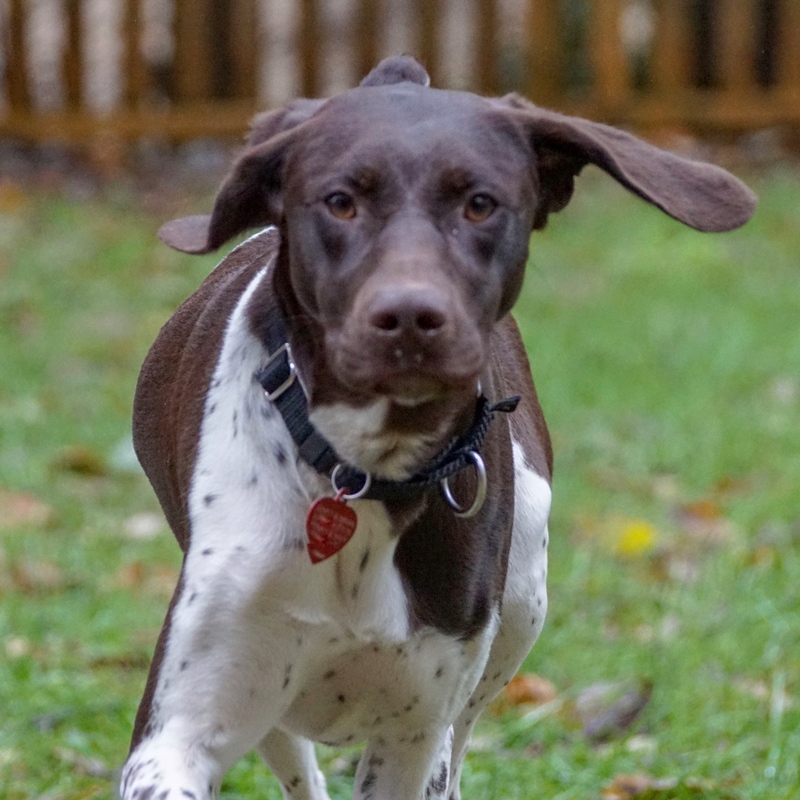 Super affectionate, crate trained, house trained, and very eager to please! Maxeen went with her foster family on Sunday. In a few days, that family decided they were interested in adopting her. 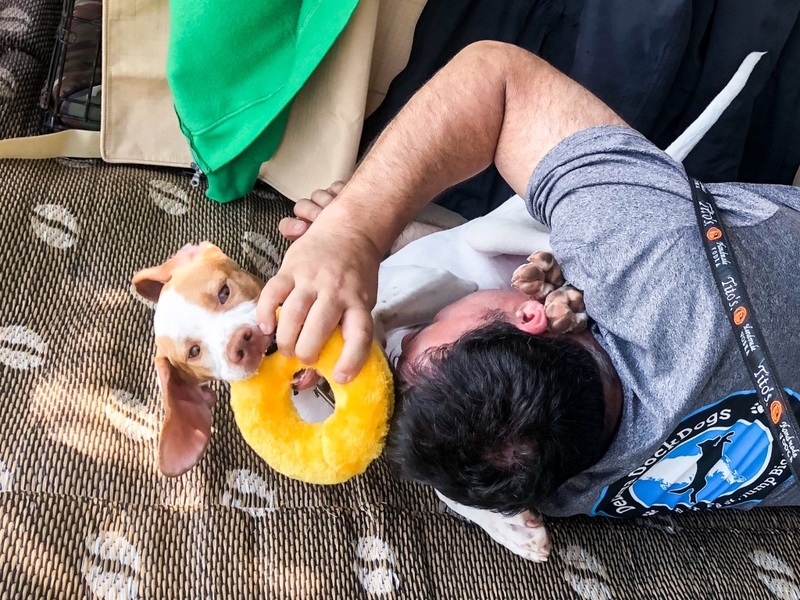 Before the adoption was official, however, Maxeen and the foster family’s resident dog had a few issues with getting along. 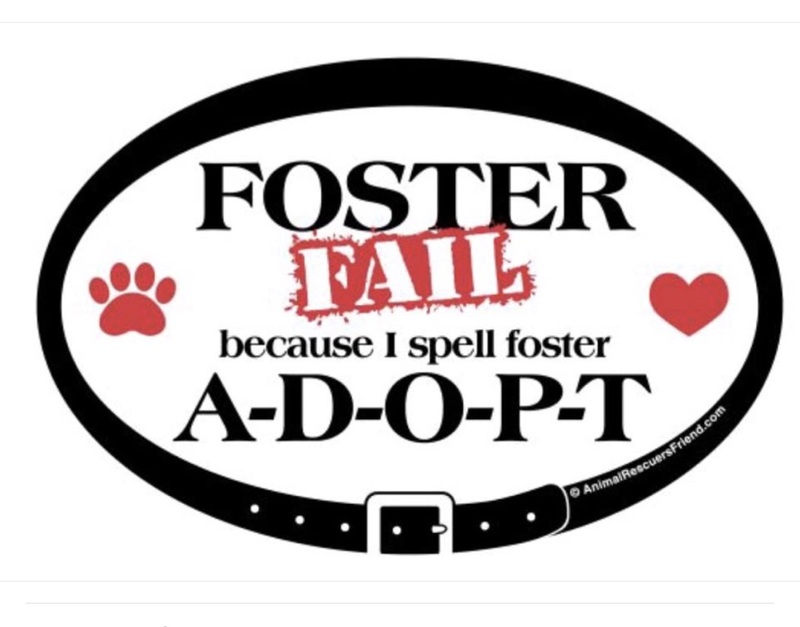 It was determined that Maxeen was not a good fit for the foster family to adopt – and in everyone’s best interest, it was determined that the ideal situation was to find Maxeen another foster. Rather than have Maxeen go through another adjustment getting used to another family, we decided to take Maxeen back to our house until she found a forever home. On November 27th, we picked Maxeen up again to take her in as our longer-term foster. 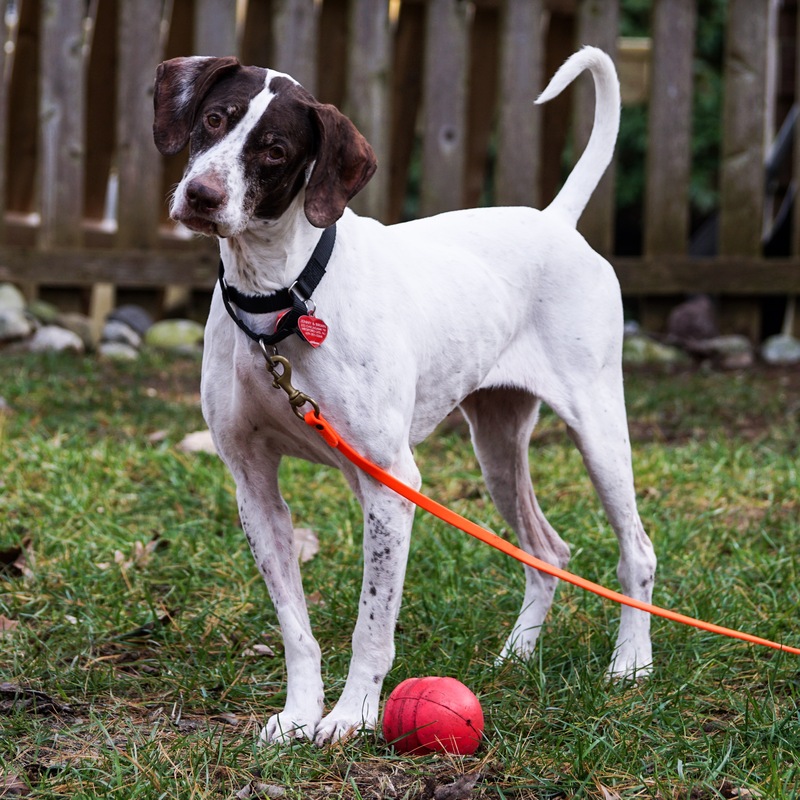 Maxeen is smart, full of energy, and willing to please! 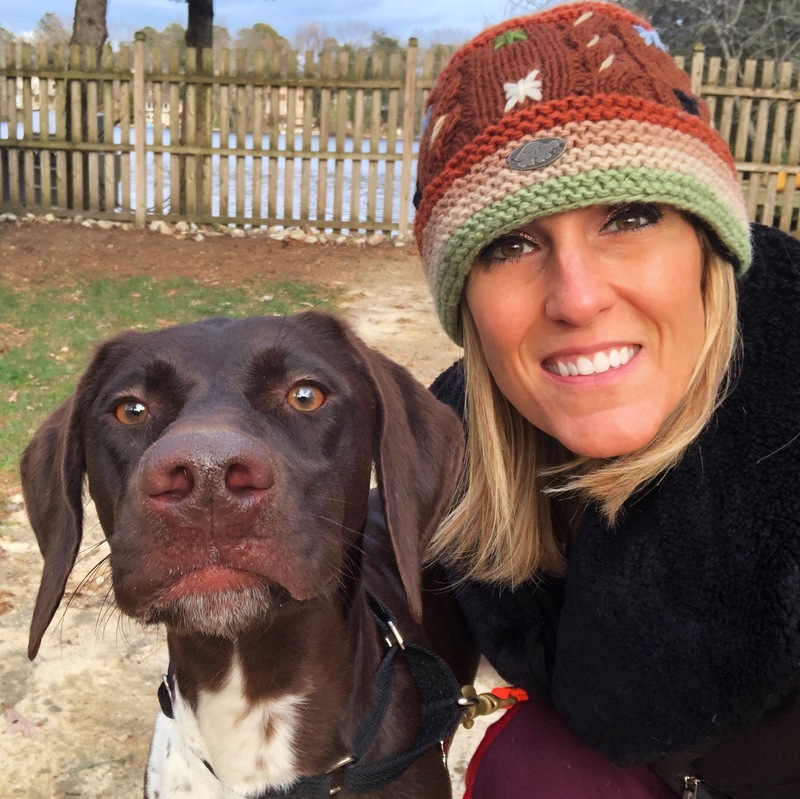 GSP Rescue of NJ had many approved applicants waiting to add a fur-kid to their family. 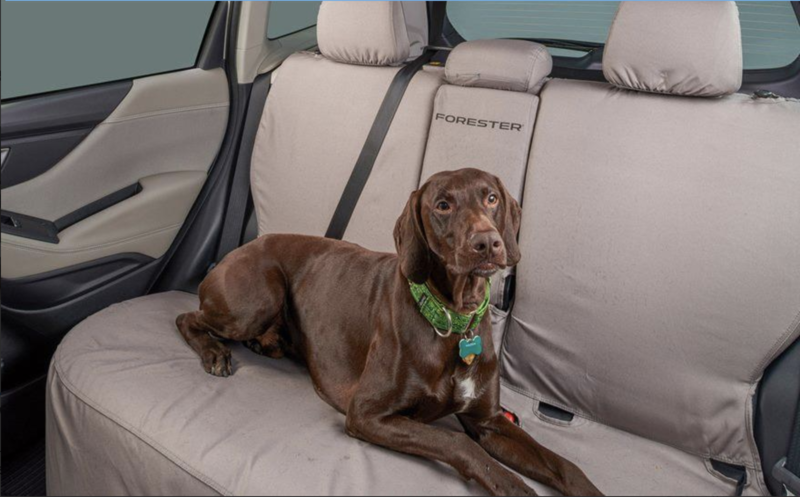 However, that list was greatly narrowed down knowing that Maxeen was best fit to be an only-dog. When we spoke to the family we thought was the best match for Maxeen, we knew immediately that they’d love her like we would! 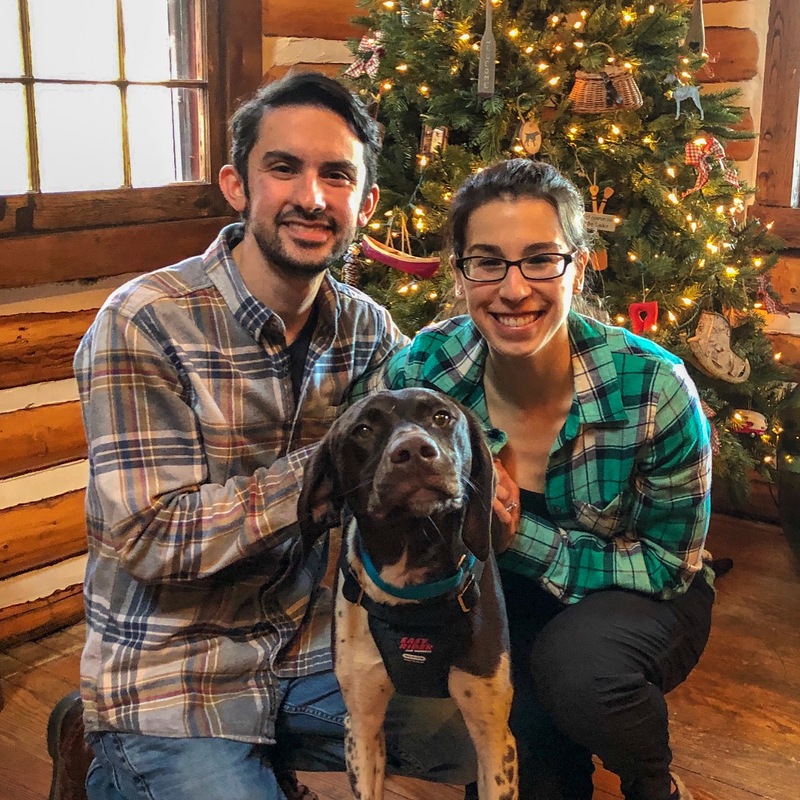 They drove 3 hours to come meet her on December 8, 2018 , and as soon as they came through the door, Maxeen greeted them both with lots of kisses. We all knew immediately that Maxeen’s forever family had been found, and Maxeen’s Christmas wish had come true! Her family took her home with them that day. Merry Christmas, Maxeen and family! 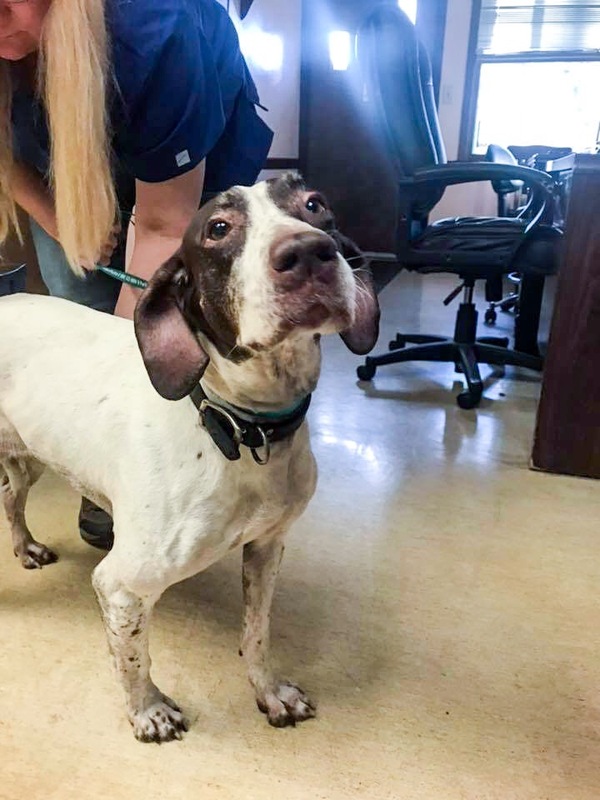 Agatha is a three year-old German Shorthaired Pointer who was found as a stray in Northern New Jersey. 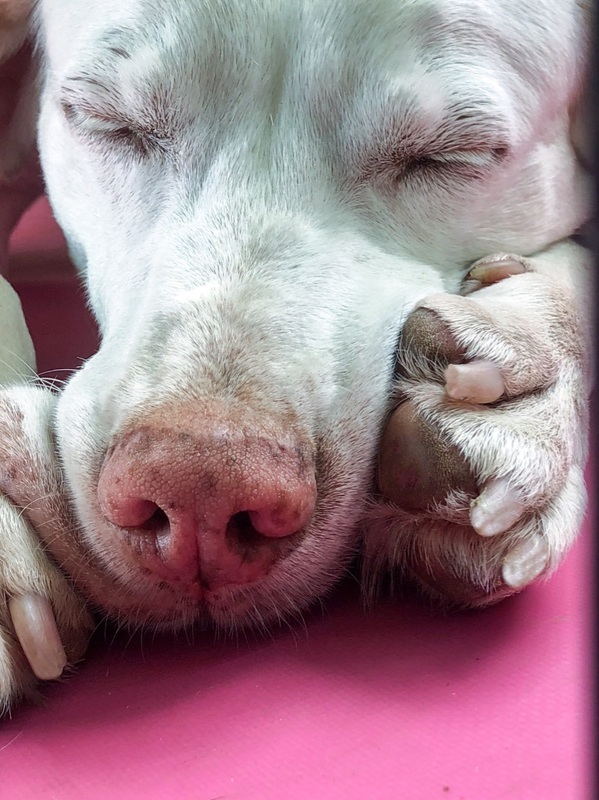 GSP Rescue of NJ stepped in to help this sweet girl. Agatha was on stray-hold for a week, and then was spayed by the rescue’s vet in North Jersey. 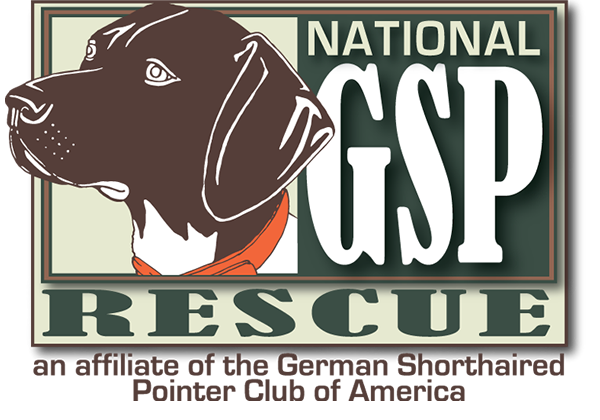 On November 16th, we drove north about an hour to a turnpike rest-stop to meet a fellow rescue volunteer who offered to transport Agatha so we didn’t have to drive as far to pick her up. 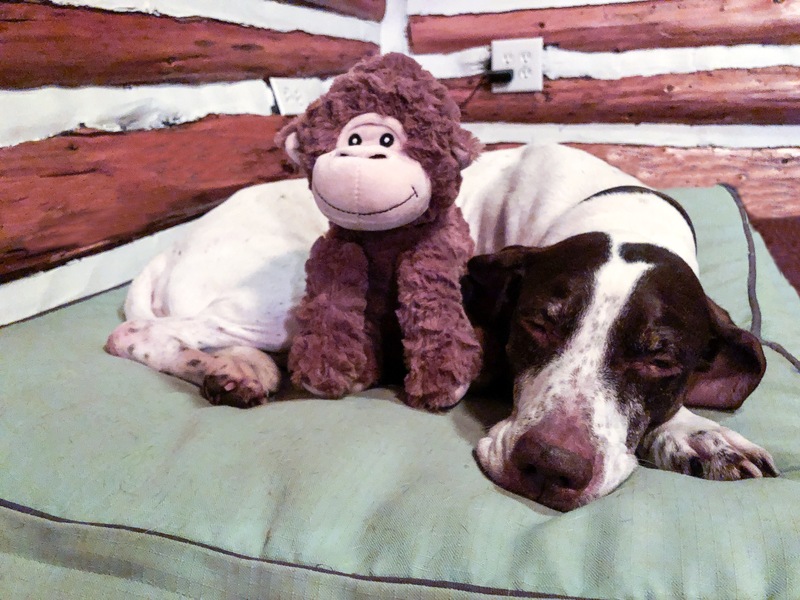 Agatha had a stuffed monkey to help her heal from her surgery. 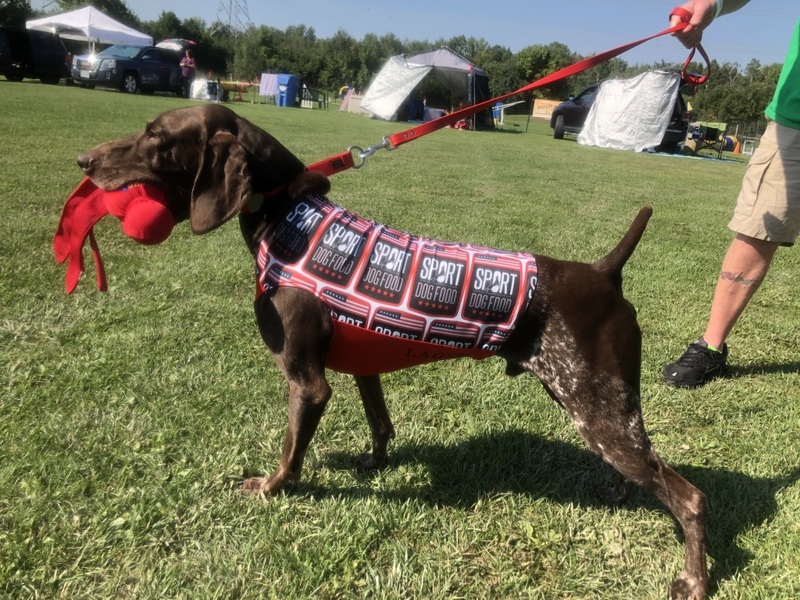 Once we met her in person, we quickly agreed that Agatha looked more like an English Pointer than a German Shorthaired Pointer. 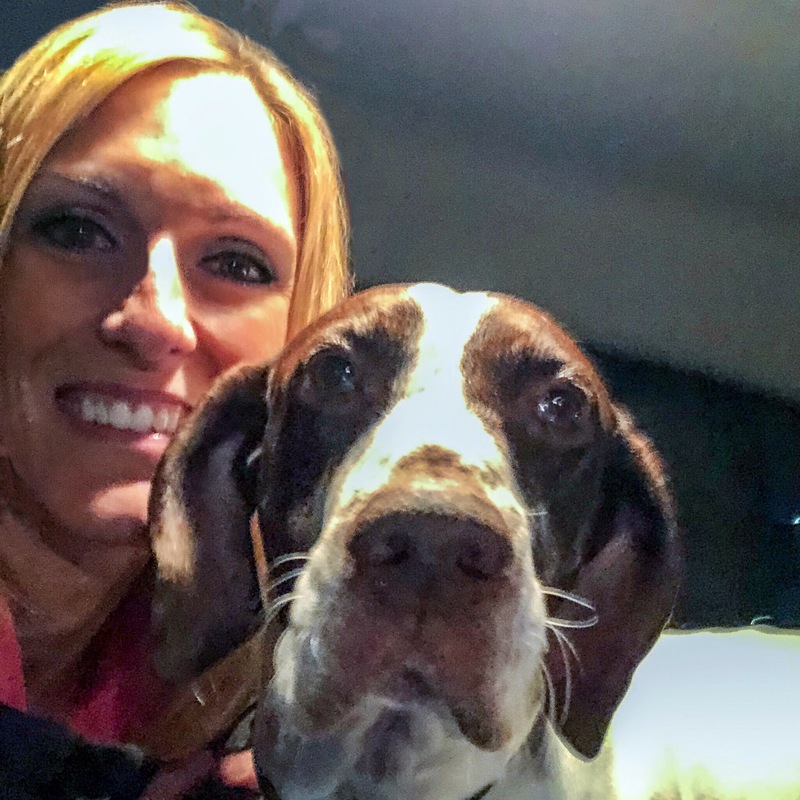 Another fellow GSP Rescue volunteer who had seen our pictures of Agatha on our Facebook, fell in love, and decided to adopt her! One of my students fell in love with Agatha and drew her picture as a gift to her forever family. Just a few days later, on the night before Thanksgiving, the rescue volunteer and her husband came to meet Agatha, and took her home! Happy Thanksgiving, Agatha and Family! This venue by far is our favorite! 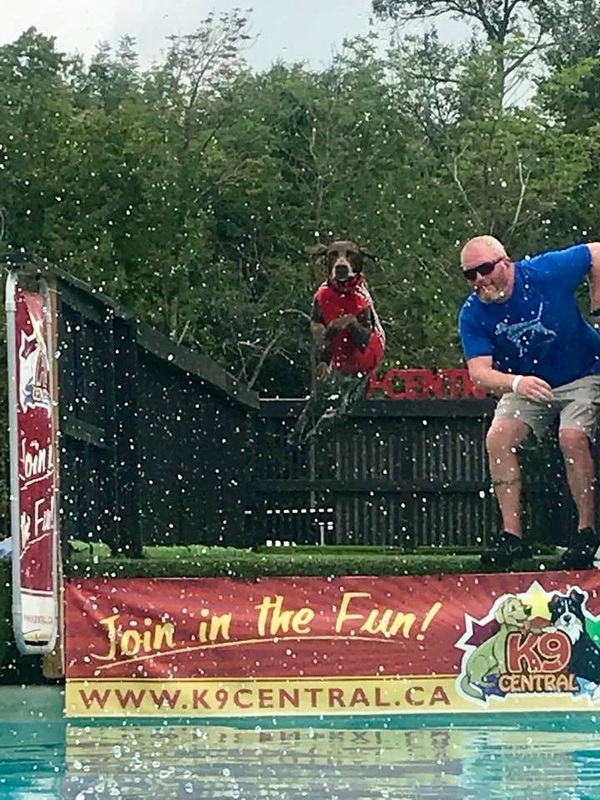 The event at K9 Central has camping on site, awesome pool set-up, and some of THE nicest people you will ever meet! Not only is the venue our favorite, the easy drive, and the beautiful scenery add to the enjoyment of our road trip. One of the most exciting parts of this journey is the Thousand Islands Bridge. I am not a fan of bridges – especially narrow ones (yikes!). 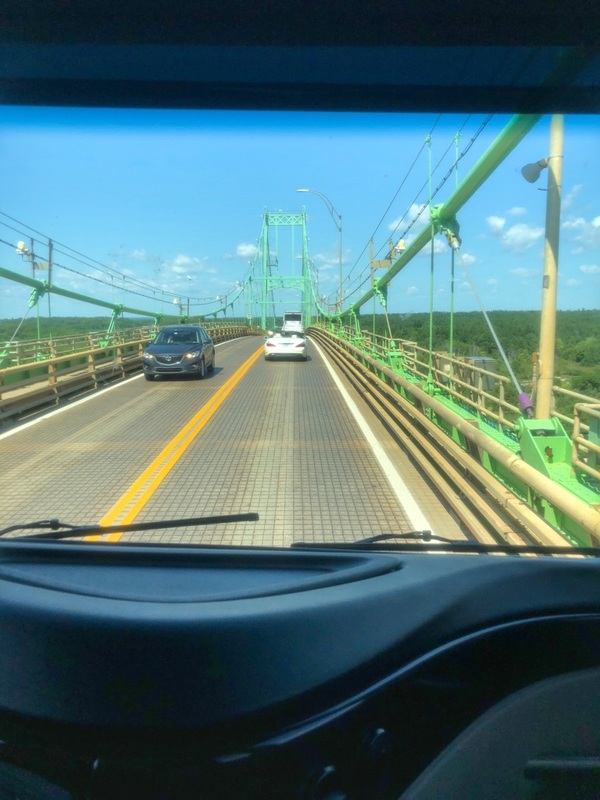 However, I do my best to put my fear aside so that I don’t miss out on the beautiful scenery of the Thousand Islands area on either side of the bridge. The view is gorgeous, and you get to see many of the privately owned islands while crossing the bridge. The past few years we had taken a few extra days off for this trip, so we are usually the first ones there! We love how close our camper is to the pool! This was also the first trip in our new camper! We upgraded to a bigger camper with double slides so we could have more room ! 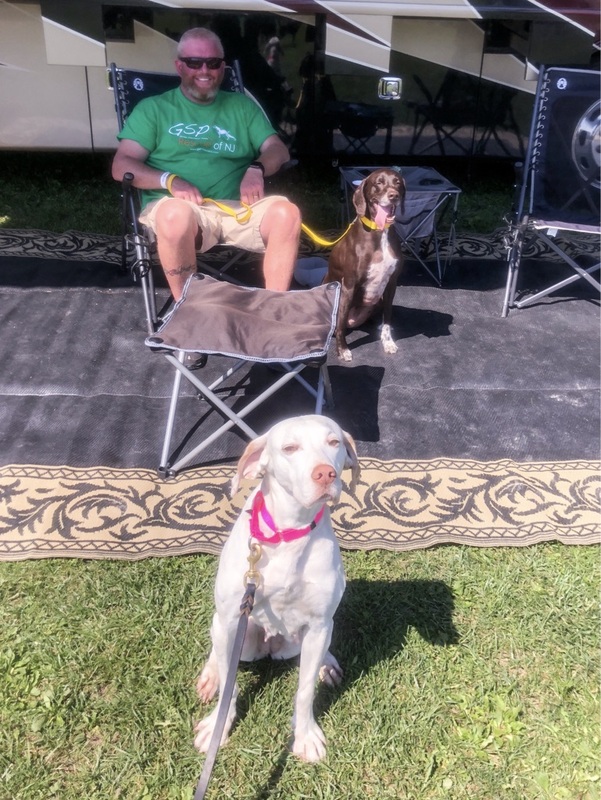 Limoncello enjoyed lounging in the camper with Margarita. 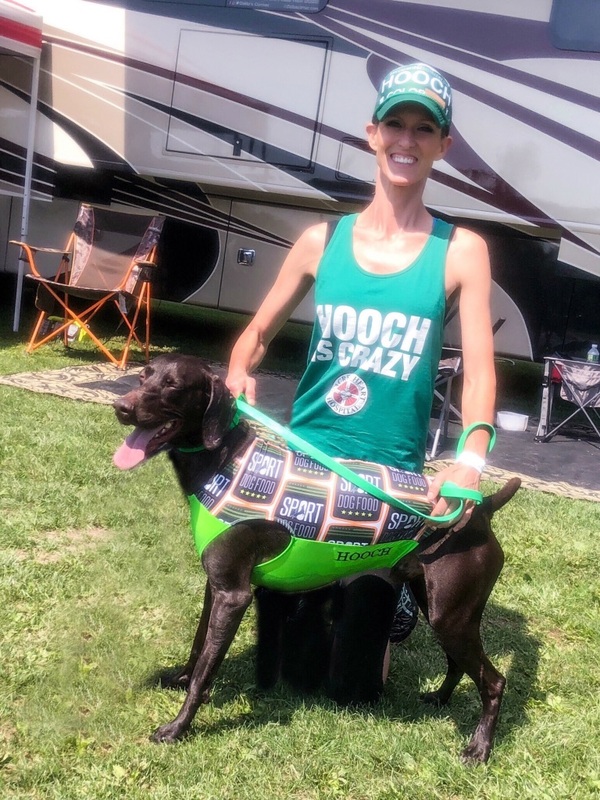 Coaching Hooch and Lager is a “ruff” job – so Cello relieved some stress by getting a massage from our friend, Marti, at Pawz Therapy. This probably was the most exciting Extreme Vertical for Hooch and Jenny as a team! 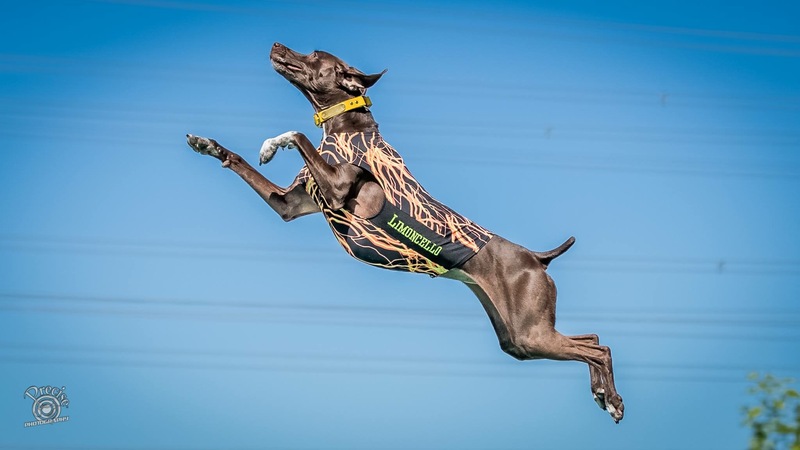 Hooch matched his personal best, grabbed the bumper at 6’6″ and in the end earned 3rd Place Top Gun Division – but not before Hooch had to go into a “jump-off” with 2 other dogs who were in a 3-way tie with him! 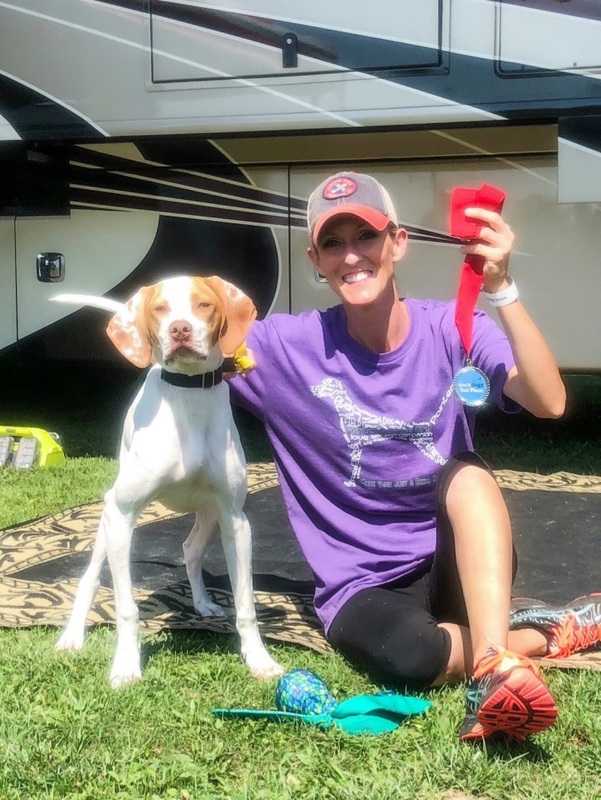 Margarita made sure to get her beauty rest in the camper with Limoncello in between cheering-on her siblings during the competition. She also enjoyed a massage with Marti! 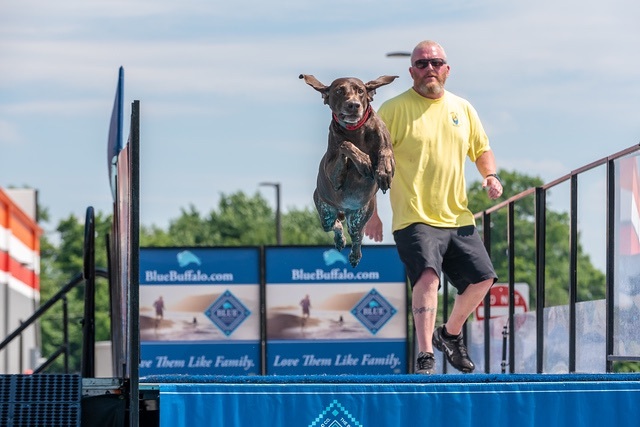 Whiskey (Wish): First Ever DockDogs Competition AND Adoption Day! Whiskey was still our foster dog, Wish at the time of this trip. However, she had begun jumping into the lake at home, so I figured, why not try her up on the dock?!?! 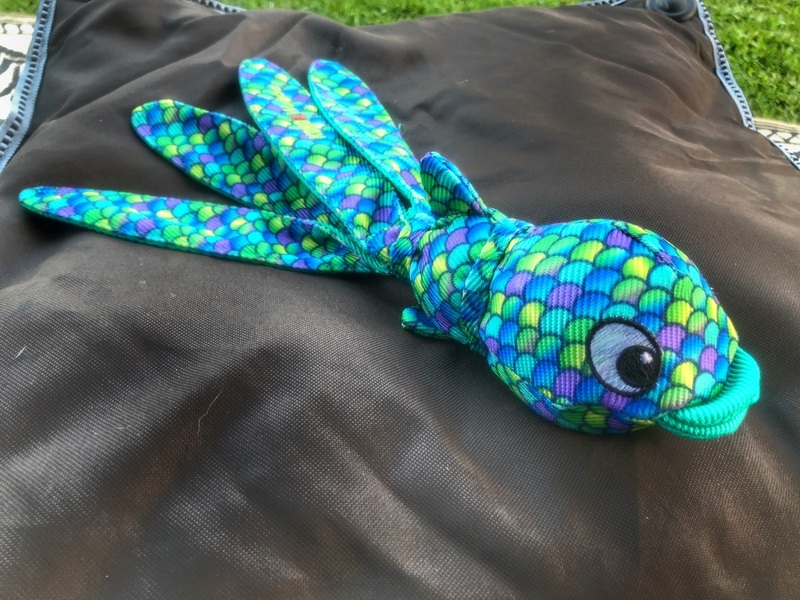 We had been calling her “Wish the Fish,” so I bought Whiskey very own “fish wubba” for the dock. 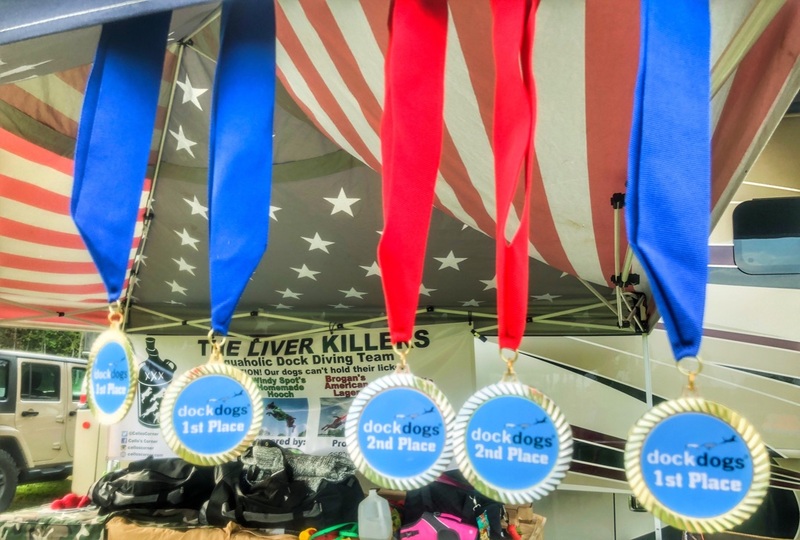 I registered her under the name “WISHkey,” as a guest Liver Killer team member, and hoped for the best! 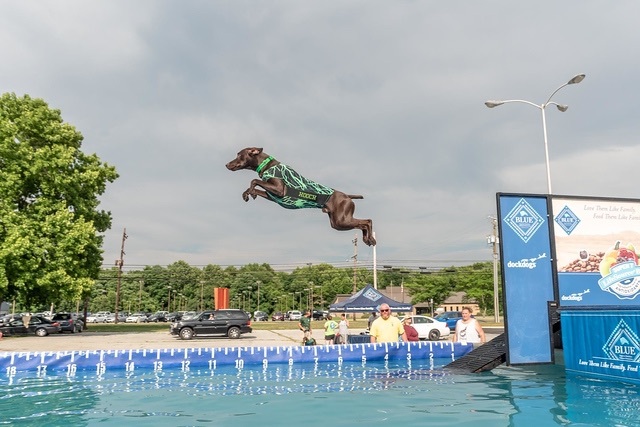 Whiskey not only jumped into the pool, but earned herself a DockDogs World Championship invitation! 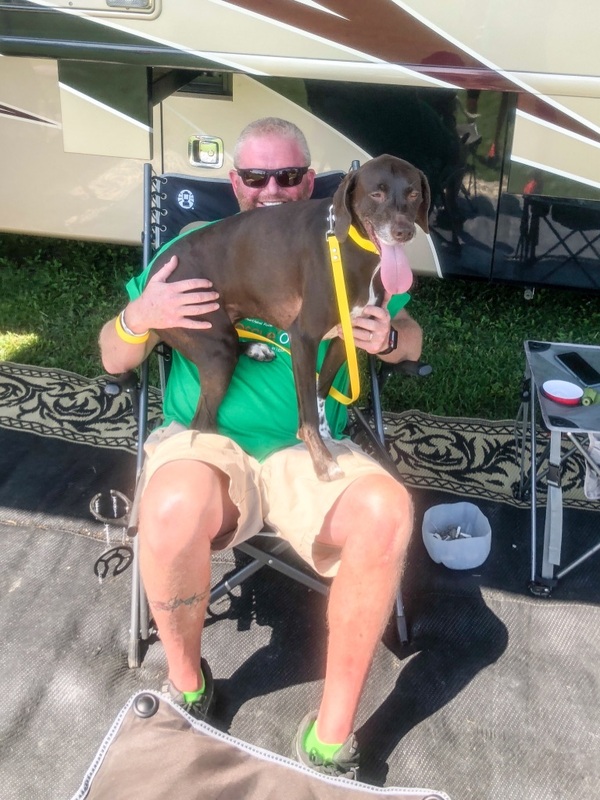 We had fallen in love with Whiskey long before this trip, but had been fighting the urge to adopt her. 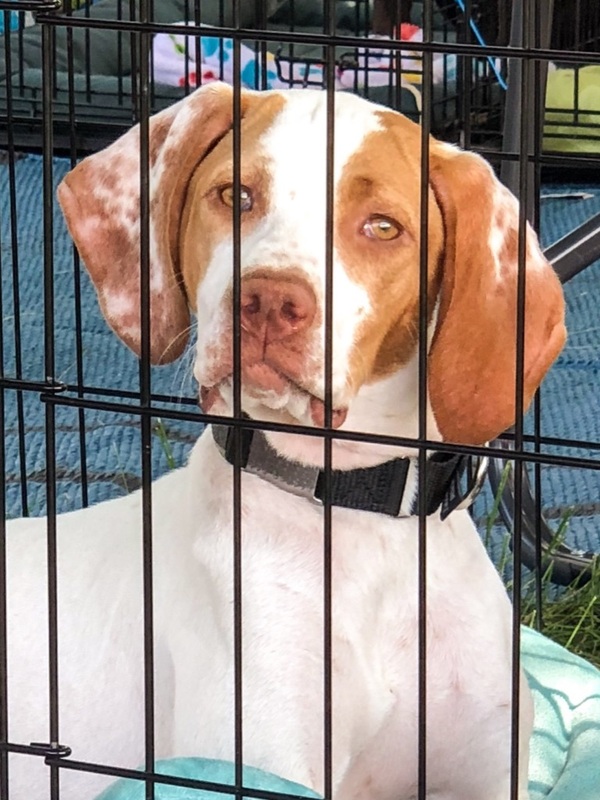 We decided while on this trip we would no longer fight that fight, and called Pointer Rescue, Organization to let them know we would like to adopt her. Welcome home, Tennessee Whiskey! 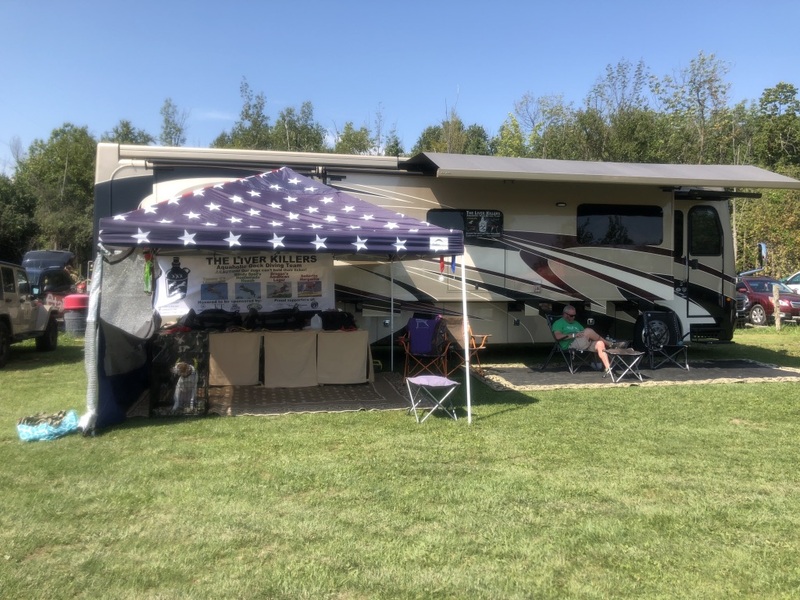 We had been known for our American Flag team canopy for quite some time now. Unfortunately, at this event, a huge wind gust came along and mangled it! We have been searching for another one ever since. This was also not a very good “maiden voyage” in our new camper. It had rained very hard the last day of this competition, and the ground became extremely muddy. We sank – A LOT – and had to get towed out. Luckily there was no damage done to the camper and we made it safely home! We can’t wait to come back to Canada next year! This was our second year back at this event. 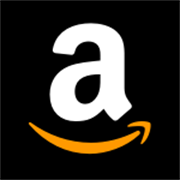 Click HERE to see us at this event last year. We like this event since it is very close to home! 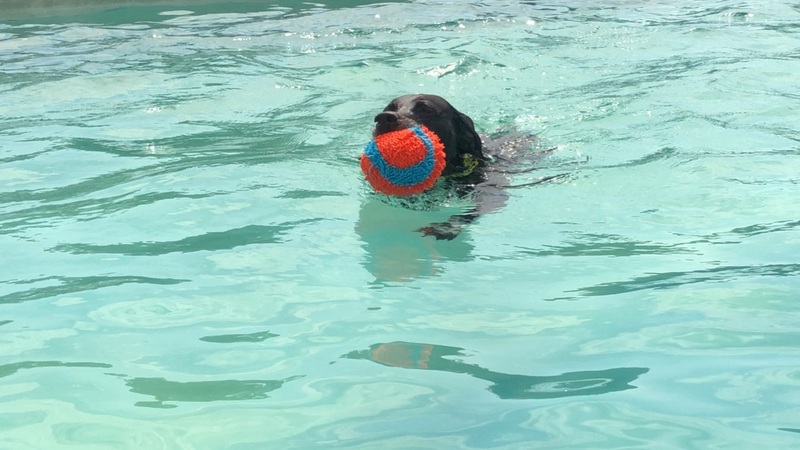 Limoncello enjoyed taking a dip in the competition pool in between the scheduled jumps. Rita was not impressed at this event, and enjoyed taking naps throughout the day. 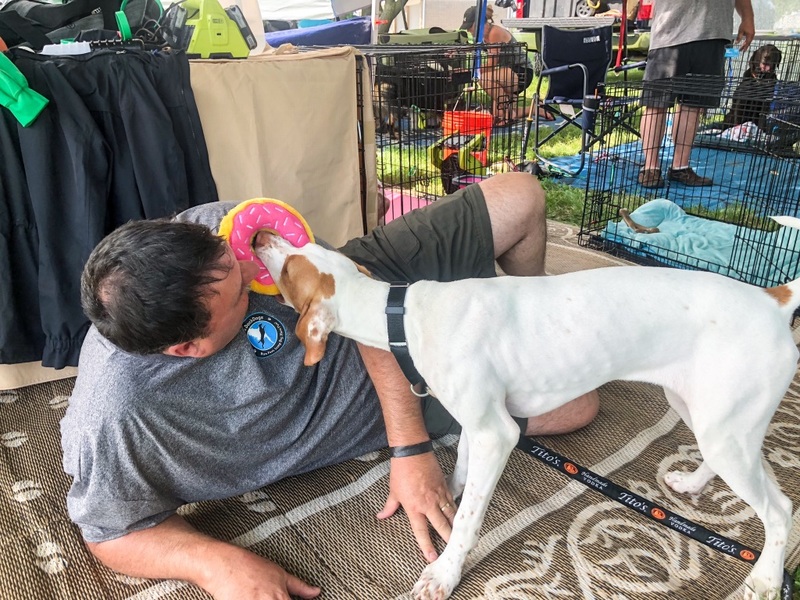 Whiskey, still our foster pup, Wish, at the time, enjoyed getting all kinds of attention! We had fun finding our eggs in our Annual Camping Easter Egg Hunt! 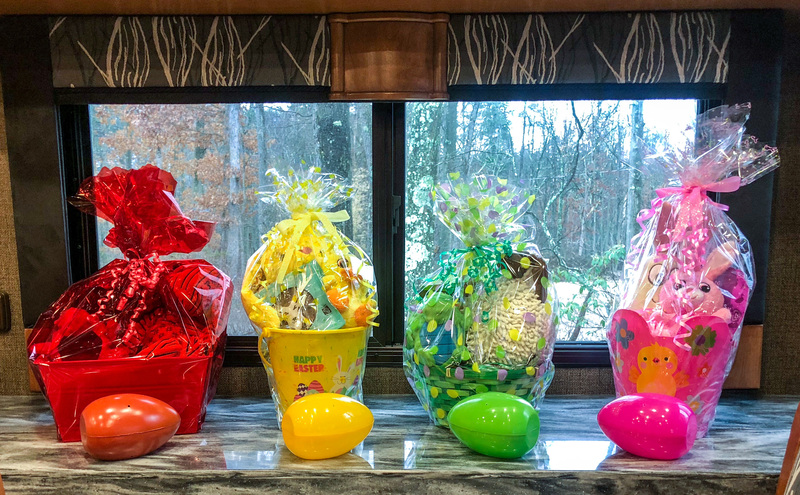 We must have been super-good this year too, because the Easter Bunny left us some goodies in our Easter baskets! 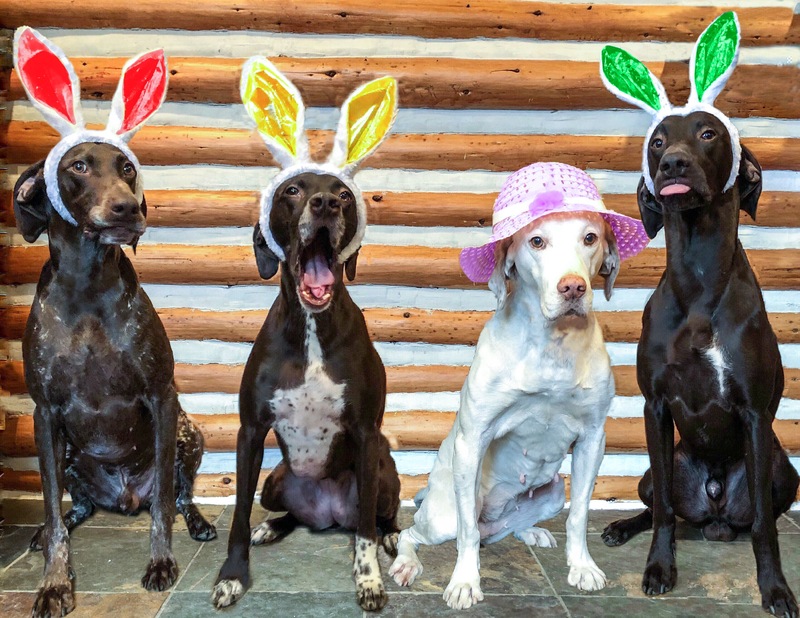 To all of our friends who also celebrate Easter, we hope that the Easter Bunny was good to you! 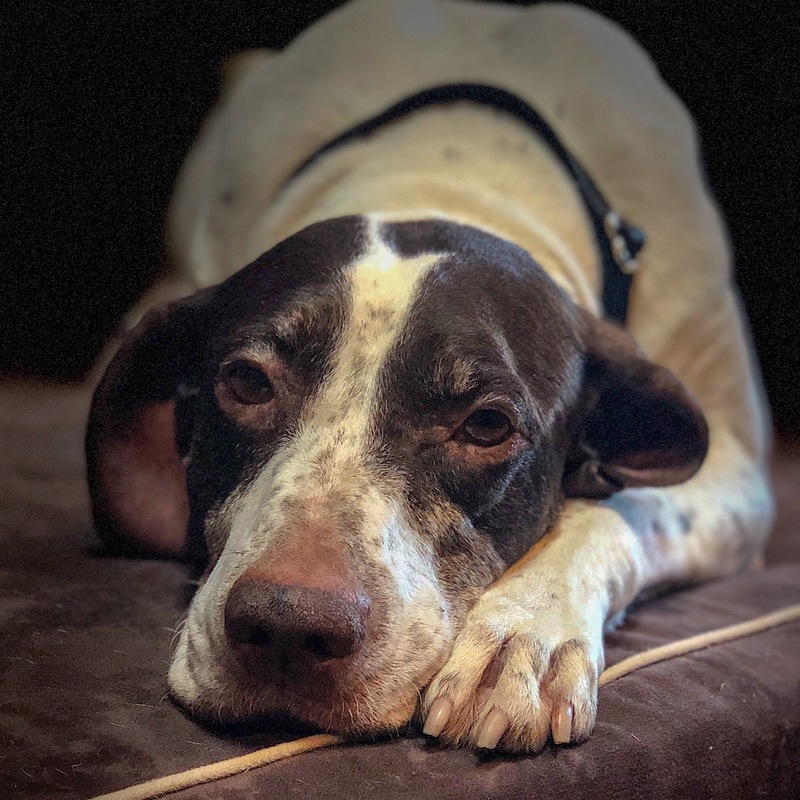 After some recent testing, Limoncello was diagnosed with dilated cardiomyopathy (a heart disease that causes dilation and poor contractility of the heart muscle). It was also discovered that Cello also has two leaky heart valves. After a long and difficult discussion with our veterinarian, it was determined that the best choice for Cello at this time is to retire her from dock diving. Although we are disappointed that Cello’s dock diving career has come to an end, we are focusing our energy on celebrating her dock diving journey and how it has positively impacted our lives: her many notable accomplishments, the abundance of joy it has brought us, the amazing people we have met, the incredible dogs we have seen, the spectacular places we have visited, and the unforgettable memories we will continue to cherish. …We have SO MUCH to be grateful for because of Cello! Without Cello on the dock this year, it will be an emotional dock diving season for sure. 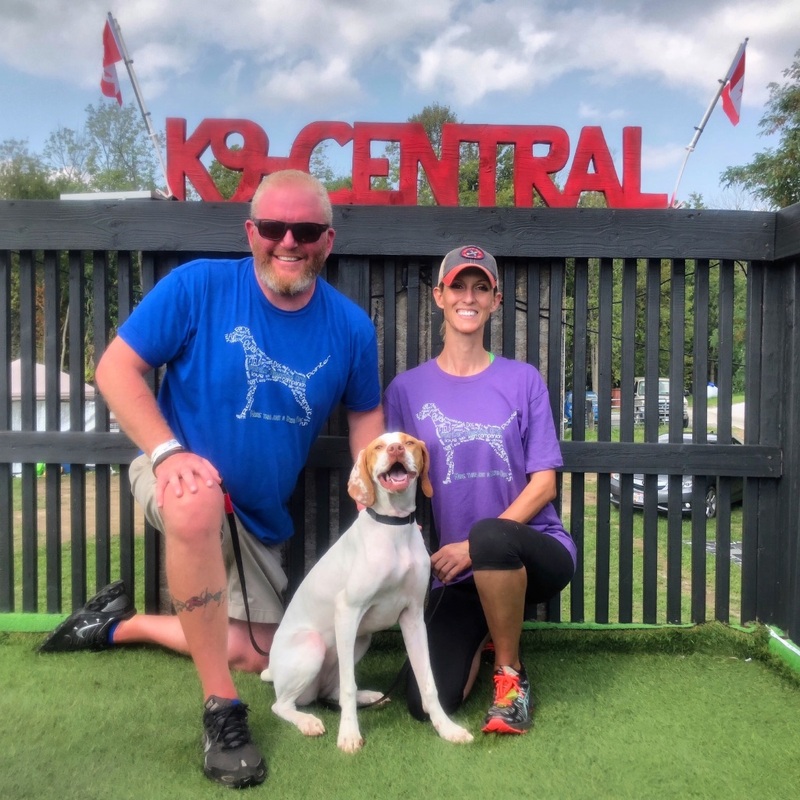 However, we are so thankful that because of the knowledge, expertise, and advice of Cello’s veterinarian and cardiologist, we were made aware of her condition before the season began. We are also looking at this unfortunate news as a positive opportunity to explore less intense bonding activities with Cello such as Barn Hunt, Nose Work, and Rally. We fondly anticipate learning new things, setting new goals, overcoming new challenges, traveling to new places, meeting more wonderful people, and building additional priceless memories. But above of all – we look forward to the many years of love and companionship we will treasure with Cello. Even if we don’t understand why at this point, we are firm believers in “change is good” and “all things happen for a reason.” We are hopeful and eager to discover what new adventures will be had as Cello once again broadens our path. However, if Cello decides that in her early retirement she’d rather just relax, we welcome that change-of-pace as well. Hooch and Lager will still be on the dock this year. 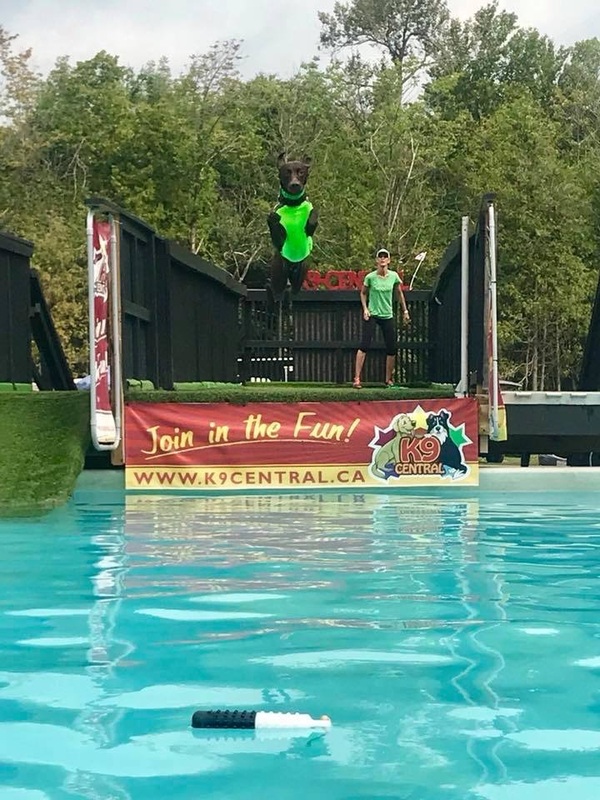 We look forward to seeing our dock diving family this season.